First off, I kind of have to admit defeat on the whole guitar thing, one of my New Year’s resolutions. I simply haven’t had the time and energy to set goals and get onto a proper practice schedule, and I probably won’t until mid-summer. 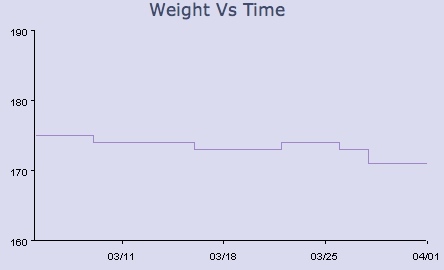 On the plus side, though, I have stayed on track with the weight loss — I’ve lost slightly over a pound a week since the beginning of the year, just by improving my habits a bit. It’s now time to mix it up a little. This month, I’ll be getting back into running regularly, and probably going to the gym just a couple of times a week for weight training. I would ultimately like to be able to run 4 or 5 times a week, which was what I was doing back when I was running regularly, though the only way I think I can pull that off while working is to go in the morning, which has not worked so well for me in the past. But in any case, I like running much more than going to the gym, so let’s just see what happens, shall we?